Tomorrow morning at 9:00 AM or thereabouts we will be leaving the Prinsendam for the last time (at least on this cruise). We haven’t seen any additional ports in the two days since leaving St. Maarten but Mary thought it would be a good idea to have one last posting about life on board Prinsendam. This isn’t everything there is to know but it is everything of which we have pictures. The idea is that this will be something for us to look back on even if there is nothing here of interest for you. 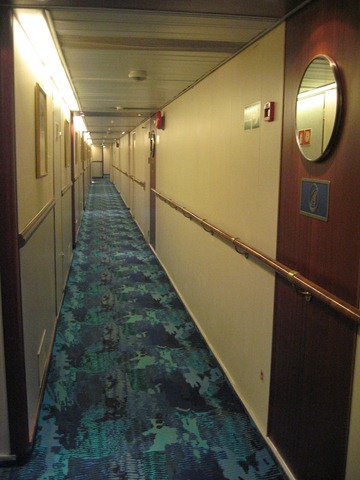 We can start with our stateroom, number 266 on the Lower Promenade Deck (deck 7). This deck is the only one that is surrounded by a full walking deck; it is a quarter of a mile all the way around & many people use it for exercise (starting very early in the morning). We liked being only a few steps from an outer deck, from which you can see everything around the ship. We have no balcony but we do have a nice large window. People walk by our window a lot (and crew often work out there) but it has a reflective coating so they can’t see in during the day. Nighttime would be a little more interesting but we generally keep our curtains closed then. Our stateroom is not, to say the least, large, but we don’t spend a lot of time there when we are not dressing or in bed. 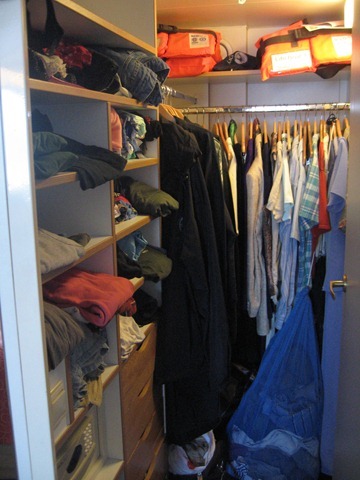 There is a large walk-in closet so we had no trouble stowing both our winter & summer clothes for a 2 month cruise. Of course on a 68 day cruise our clothes had to be laundered, which we did in one of the ship’s two self-serve laundries. They are free except for the time spent, which sometimes was considerable because the driers often were less than adequate. There is a laundry service on the ship as well but it is expensive (unless you are a 4 star Mariner, which means you have spent at least 200 days on Holland America ships, for whom it is free). 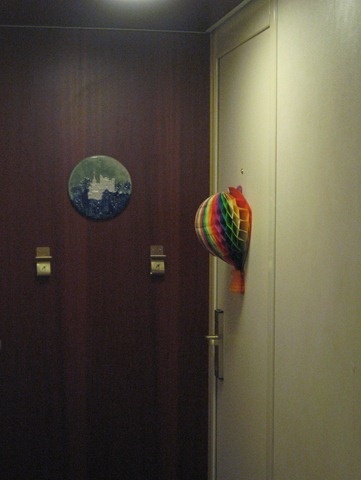 Our door is distinguished by a 3D paper balloon that our travel agent, Cruise Specialists, attached to the doors of the 85 or so passengers whose cruises they booked. Cruise Specialists also have two “hosts” on board, Henk & Lucia, to help resolve any issues we might have. They also lead shore excursions set up by Cruise Specialists & host cocktail parties & chat sessions on sea days. Next we can talk about food which is, of course, a central feature of life at sea on a cruise ship. Holland America does a very good job on restaurant meals, almost always quite good & a good variety as well (always about 6 entrees to choose from at dinner). Their best product on this cruise was their soups, but there are always rich entrees (rack of lamb, steaks, all kinds of fish, ethnic specialties) and desserts (ice cream & sundaes, pies & cakes, chocolate & grand marnier soufle). There are two assigned seatings on Grand Voyages like this one: 5:30 & 8:00. 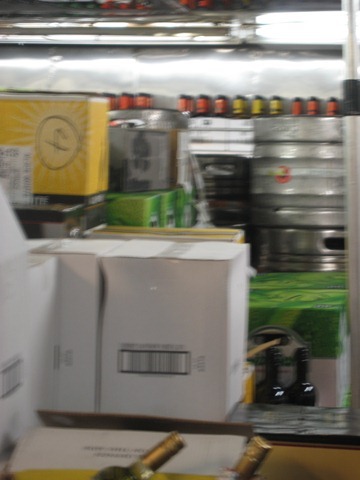 We are on the late shift, which gives more time in port. We sit at a table for 8 (you can choose fewer if you want), & we have sat at this table and made some good friends from our tablemates, who we see almost every night on this lengthy cruise. We feel very fortunate that our tablemates & our wait staff have been people we like; not everyone has been that lucky and two months is a long time to spend with people you don’t like very much. For the first half of the cruise there were only six of us at the table (Bing & Barb; Steve & Kathy; Rick & Mary), but halfway through another couple (Malcolm & Jean) transferred to our table. 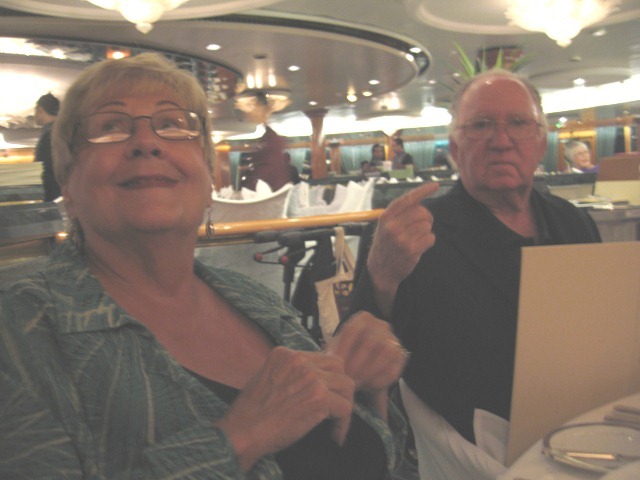 Malcolm & Jean used to live in the Panama Canal Zone where Malcolm worked as a Canal Pilot. 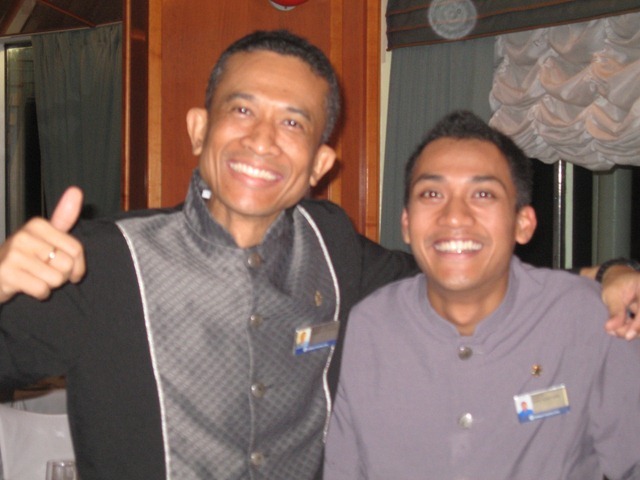 Our excellent wait staff included our head waiter Dewa, assistant waiter Eddy & wine steward Ben. All three were excellent at their work & fun to be around for two months. Dewa & Eddie are from Indonesia & Ben is from the Philippines. 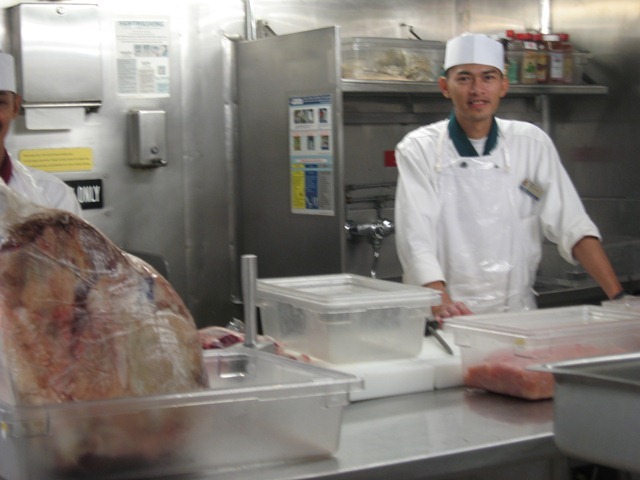 A few days ago we took a tour of the ship’s galley which appears to be an extremely efficient operation; it would have to be, since they serve about 4000 meals every day. The galley runs 24 hours a day producing bread & pastries as well as meat & vegetables. 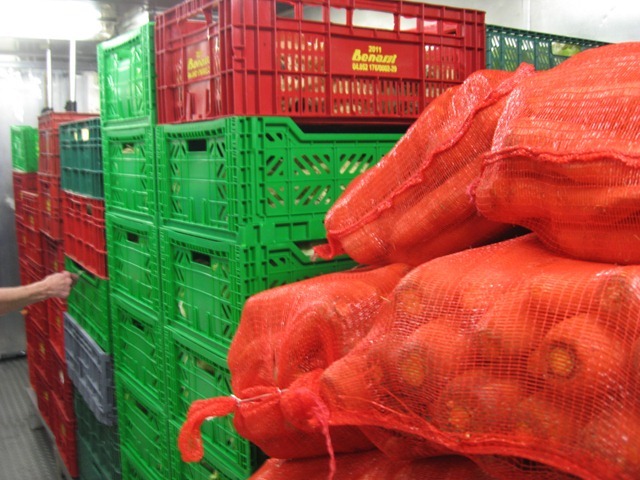 Food that is more than 4 hours old has to be discarded. Wretched excess, and I imagine quite a lot of food goes to waste. There were nine “formal” nights at dinner throughout the cruise where suits & ties were expected, although many folks really wore formal attire such as tuxedoes & cocktail dresses (you won’t be surprised that I wore a sports jacket & tie instead). Throughout the voyage there have been special days at dinner, which usually meant that there were special decorations in the restaurant & the waiters were dressed in special costumes. I have below a picture of Dewa, our waiter, in his costume for “Escape from Devil’s Island” night. We had a number of barbecues on deck & special ethnic buffets in the dining room at lunchtime throughout the cruise, and recently there were two “extravaganzas”: a “gala” at lunch one day, with ice sculptures, and a “chocolate extravaganza” one night after dinner. While we took pictures of both to share with you we didn’t eat at them (or at least didn’t eat much). The ship was striving for decadence & achieved it. Then on the next-to-last night the dinner was followed by a waiters’ Baked Alaska Parade (a tradition on cruise ships), in which they carried Baked Alaskas with lights around a darkened dining room to great applause & waving of napkins, before serving them for dessert. In addition to the La Fontaine restaurant where we ate dinners there is the Lido, which is a buffet style restaurant where we ate lunches & most breakfasts (breakfast & lunch could also be had in the La Fontaine, but the times were more restricted). For lunches the Lido always has several entrees plus three Asian selections. They always have something that is freshly carved as you wait (beef loin, leg of lamb, pork loin, turkey, etc. ), which I usually used to make a sandwich with their fresh baked bread. There was also a sandwich bar, made to order, pizzas by the slice, a hamburger grill out on the deck, and an ice cream station, which is open all day. The Lido also had for most of this trip the slowest coffee machine in creation (making coffee that really wasn’t worth the wait, unless you were after some caffeine), but they fixed it a few days before the end so that now at least it pours its poor excuse for coffee quickly. We liked sitting in the outdoor section on the aft of the ship where you could usually overlook the city if in port or watch the birds & the waves if at sea. Unfortunately in bad weather (such as in Antarctica or when there were storms) this area was closed making the Lido very crowded, so in November Holland America plans to enclose this lovely area. It will still have sliding glass doors on the sides, so it will be semi-open, but I don’t think it will be the same. Among the public rooms where we spent the most time were the Explorations Lounge (see the pictures in the first post about Prinsendam back in January) where we went almost every day for a pre-dinner concert by the Rosario Strings. The Rosarios are a trio consisting of violin, piano & bass, who play a wide-ranging repertoire from classical to musicals to rock to country (they do a dynamite version of Orange Blossom Special). They are quite good, particularly the eclectic pianist who seems to know all of the world’s music by heart & plays it all with superb technique & panache. We will miss the concerts before dinner when we get home. In addition, we spent a great deal of time in the Showroom At Sea, the largest room in the ship where all the entertainment, lectures & sundry other events occurred. This is also where you often wait for your turn on the tenders into ports . . . sometimes for what seems an unreasonably long time. This room will be getting a much needed makeover when the ship is in drydock in November. A third room where we spent some time, at cocktail parties plus a whole afternoon in the Antarctic taking pictures of animals on icebergs, is the Crow’s Nest. This is basically a large cocktail lounge and dancing venue located at the top of the ship in the front, with a panoramic view of everything in front and on the sides of the ship. It was completely redone in one day, the day we left Ft. Lauderdale. Then a few more random things. Not very interesting, perhaps, but important to us was our assigned lifeboat (No. 4 of 8). 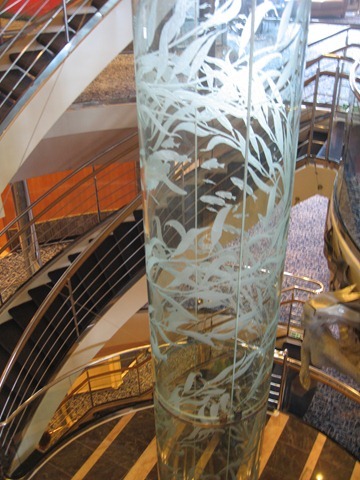 The central atrium, while small in comparison with most more modern ships (Prinsendam, built in 1988, is one of the older cruise ships around), has a beautiful two story etched glass tube sculpture. And across from that, on the floor above ours, is the main desk, staffed by personnel who will answer any question you may have, whether they know the real answer or not. And our two lovely librarians, Jessica and . . . Jessika. Not a bad gig for a librarian! Finally, here is a glimpse of some of the artwork that you can see all over the ship. It is quite varied & much of it is quite beautiful, often even whimsical, as well as valuable. It certainly adds a lot to the ship’s elegant ambiance. And finally, here is a look at our Captain, Tim Roberts. He’s an Englishman who dropped out of school at age 16 to go to sea & has worked his way up to this position over the years. He has a droll sense of humor and a fascination with all things nautical, both of which he shares with us at least once a day during his ship-wide announcements (which also tell us our position & course & speed & the weather, etc.). Here is also a look at our Travel Guide, Frank Buckingham, a 77 year old Englishman (big cricket fan), whose encyclopedic knowledge of just about everything on our route & entertaining delivery of voluminous information about each port greatly enhanced the experience. He is retiring after this cruise (the scuttlebutt says it is not entirely his idea, which would be a stupid move by Holland America), so we are glad to have had him along.